Rear Adm. Tom Druggan, a surface warfare officer at the U.S. Navy, has been appointed as commander of the Naval Surface Warfare Center. 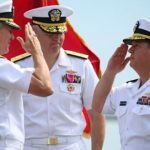 He relieved Rear Adm. Lorin Selby, who has led NSWC since October 2014, during a change-of-command ceremony Thursday, the Navy said Friday. Druggan previously commanded the Aegis ballistic missile defense destroyer ship USS O’Kane and served as program manager of Aegis combat systems in the service branch’s program executive office for integrated warfare systems. He also managed the In-Service AEGIS Fleet Readiness and In-Service Aircraft Carrier Combat System Integration programs. He was also assigned to the Defense Department as special assistant to the chief of naval operations and special assistant to the vice chief of naval operations as well as served as a staff member of the 2001 Navy Quadrennial Defense Review and founding member of the Navy operations group Deep Blue.